Kia has unveiled the e-Niro all-electric crossover at the 2018 Paris Motor Show, expanding the lineup to include two drivetrains. The Kia Niro has the distinction of being engineered to be offered with fuel-efficient and low-emissions drivetrains only, with the new all-electric variant joining the earlier petrol-electric and hybrid/plug-in variants. The e-Niro uses the same powertrain as the India-bound Hyundai Kona EV and was first showcased as a concept at CES 2018 earlier in January this year. Part of Kia’s ACE (Autonomous, Connected and Eco/Electric) strategy under which the company intends to launch 16 electric/hybrid cars in its portfolio by 2025, the e-Niro is expected to see a huge demand in markets across Europe and the US. 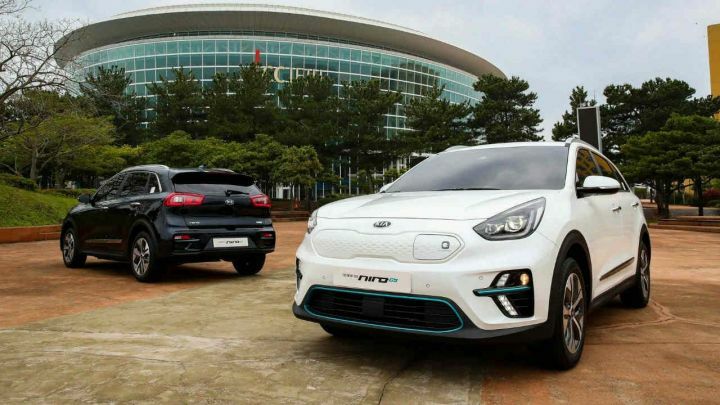 While Kia has not stated if the Indian market will be part of this plan, it may follow Hyundai in launching halo electric products to garner more attention. Kia India, meanwhile, is currently focussing on making its debut in 2019 with the SP/Trazor SUV. The Kia e-Niro is available with two battery packs and two tunes for the electric motor powering the front wheels. The base variant can be had with a 39.2kWh battery pack powering the 136PS/395Nm motor with a claimed range of 310km on a single full charge. The larger 64kWh battery promises a maximum range of 484km on a single charge, while the more powerful motor configuration develops 204PS/395Nm. The fastest variant of the e-Niro will be able to accelerate from 0-100kmph in a respectable 7.8 seconds. Kia claims a 100kWh charging port will be able to charge the e-Niro from no charge to 80 per cent charge in just over 50 minutes. The Kia e-Niro looks like its hybrid twins but with telltale electric design elements. The triangular headlamps get LEDs, while the fog lamp cluster gets new LED DRLs. The grille has been covered in typical electric-car fashion, a part of the grille is the cover for the charging port. The alloy wheels are designed to be aerodynamically sound and offer as less resistance as possible. The taillamps feature all-LED lighting instead of the regular reflectors on the hybrid variants. There are dashes of electric-blue accents all over the car to drive home the point that this is an electric car. 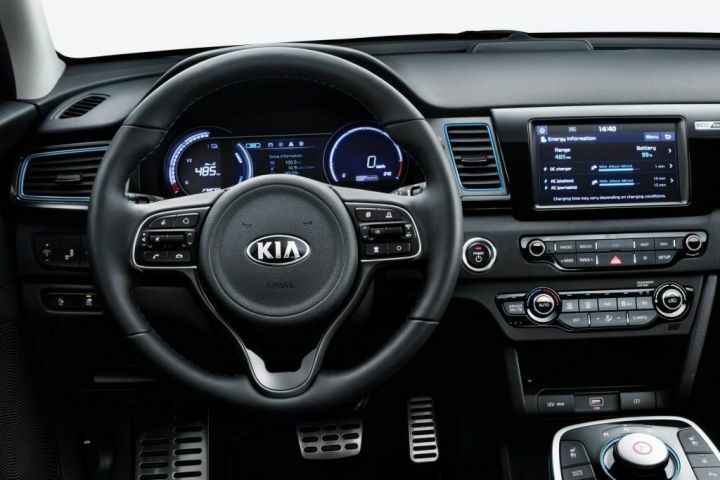 Inside, the changes include blue accents all around the cabin, the replacement of the gear lever with a rotary drive-mode selector and an all-digital instrument cluster. The lack of a transmission tunnel has freed up a lot of storage space in the lower centre console. Paddles behind the steering wheel can be used to control the amount of brake regeneration. The e-Niro also gets Level 2 autonomous capabilities, which gives it features like a traffic jam assist (car follows traffic and stops with it, maintains lanes), emergency braking and lane-keep assist.